Sagittarius is coming . . .
Big noise this week is about the Sun leaving the deep, intense waters of Scorpio and bursting out into the wide open spaces of Sagittarius. I find this transition one of the most dramatic the Sun makes. It always feels like I’ve escaped one more time . . . though from what I’m not entirely sure because I do like Scorpio. The last days the Sun is in Scorpio will see Mars in Virgo sextile Jupiter in Cancer. This is a quietly upbeat sextile combining Virgo efficiency with Cancer’s love of seeing loved ones cared for. This is a great time to help out in practical ways by volunteering to clean the house or the yard. Small helpful gestures will count just as much as the grand ones. Mercury in Scorpio returns to make one more translation of the Uranus-Pluto square on Tuesday and Wednesday. What might occur is revisiting issues brought to our attention on November 1 once again. Perhaps this time we will be able to resolve those now that we’ve had a chance to think about. Mercury in Scorpio always benefits from more thinking time. Thursday, November 21, is the day the Sun enters Sagittarius and over the weekend is when it will be square Neptune in Pisces. Speaking of the weekend, it is looks quite favorable for enjoying ourselves for a change. The Moon spends the whole weekend in Leo who loves to throw a good party. Venus in Capricorn is sextile Saturn in Scorpio and that ought to ensure we don’t get too far out of line. We journey this week from a complacent Full Moon in fixed Taurus to the elusive joys of a mutable Sun in Sagittarius-Neptune in Pisces square where little is as it appears to be. Quite a ride, yes? It should be fairly easy for you to stay in a positive frame of mind this week, Aries. Your energy levels look good and your spirit will get a big boost late in the week as your horizons open up once more. It has been awhile coming. Conversations with your partner may be quite productive now, Taurus, whether they concern joint finances or ongoing projects. You have no trouble maintaining the necessary discipline to achieve your goals. Enjoy spending time with family this weekend. Your mental gears are engaging more smoothly now, Gemini, and that helps keep you sane. Thankfully your ability to see the humor in awkward situations and make jokes about it begins to return later this week. Yes, the light at the end of the tunnel approaches! Coming up with creative solutions to longstanding issues regarding your career is possible this week, Cancer. You might get help with this from an old friend or your significant other. Clear your head by heading outdoors for a long walk. Discussions with family members may prove surprisingly fruitful at this time, Leo. Be sure to keep an open mind through all this. You could find your interest in going out to play and generally enjoy yourself returning by the weekend. Make the most of it! The first half of the week looks very favorable for dealing with complex problems, Virgo . . . your specialty. If these deal with projects that have been on hold for awhile, be sure to do your best to complete them ASAP. It has been awhile since you felt much interest in spending time with your friends, Libra, and that is about to change. First though you need to tidy up loose ends regarding your personal finances, then you can relax and play this weekend. Finishing up old business needs to take priority the first part of the week, Scorpio. You certainly have the necessary focus to handle that with ease. The spotlight moves off of you late in the week, something I doubt you will regret! There is a good possibility your recent hard work could be rewarded now, Sagittarius, though don’t use that as an excuse to slack off. Wait until the weekend to celebrate with friends and family. Life starts to look a little brighter than. Take advantage of the first part of the week to review your goals and objectives, Capricorn. You have the clarity now to catch anything you may have missed earlier. The next month is usually a good time for you to step back and relax. Now would be a good time to wrap up any outstanding work related projects, Aquarius, because by the end of this week your attention may begin to shift to more light-hearted enterprises. Go play over the weekend with your partner! The first few days this week look very favorable for you, Pisces, and a good time to do something just for the fun of it. All too soon you are going to be more visible than usual, especially in regards to your professional life. ← Observations: Yay! 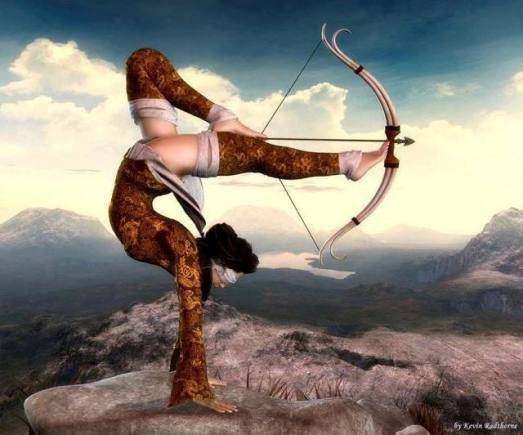 Sagittarius Season is just around the corner!